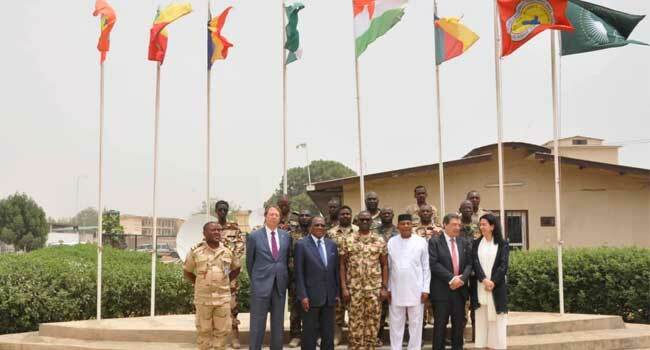 A delegation from the United Nations, the European Union have visited the Multinational Joint Task Force headquarters in N’Djamena, Chad, to proffer solutions on how to tackle Boko Haram insurgency. Speaking during the visit Special Representative Francois Fall thanked the Force Commander, Major General Chikezie Ude for the successes recorded in the ongoing Operation YANCIN TAFKI, noting that the progress made so far is encouraging. He observed that the Boko Haram problem requires more than a military solution, stressing that there is a need to also examine and address the socioeconomic underpinnings of the crisis. Also speaking, Mr Angel Losada, conveyed the support and solidarity of the European Union to the MNJTF, adding that the Union will remain in partnership with the MNJTF, particularly, in the areas of political strategy and intelligence sharing. In his contribution, Mr Mohammed Ibn Chambas, noted the serious disruption of economic activities among countries of the Lake Chad Area by Boko Haram Insurgency. He observed that a lot of efforts will be required to deal with the attendant challenges. The Force Commander commended members of the delegation for the visit. He remarked that the fight against Boko Haram would not have been possible without the support of the international community. The leader of the delegation, Mr Abdel Mahjid, said their mission is to assess the MNJTF Area of Operation with a view to making recommendations on how the UN can support African led missions. The delegation comprises of the Special Representative of the United Nations Secretary-General to Central Africa, Francois Fall, the Special Representative of the United Nations Secretary-General to West Africa and Sahel, Mohammed Ibn Chambas and the Special Representative of the European Union to the Sahel, Angel Losada.